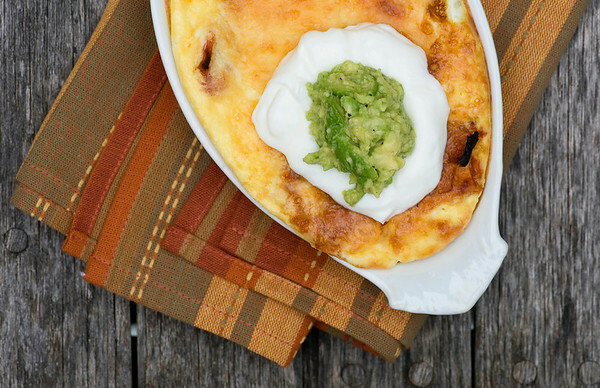 Here’s the thing about this baked taco frittata. I do love me a good omelet, and I wish I was one of those people who could make a good omelet. I’m not. I’m one of those people who try to make a good omelet, but end up making something that looks more like scrambled eggs with stuff in them. It tastes fine, but it’s not very handsome. Which is why I think I love frittatas so much…especially the oven baked kind. No battling with your frying pan, just fluffy delicious eggs filled with scrumptious insides. In this case, chorizo sausage, jack cheese, taco sauce and crushed tortilla chips. Even better, they cook up in individual dishes, so there is no bickering about who got the bigger piece when you slice it up, since there is no slicing up. Everyone gets their own personal dish of frittata heaven. Sounding better and better, right? So here goes. Start with about 4 ounces of chopped up chorizo sausage…or if you prefer a different kind, that’s fine too. I use chorizo because it’s going to give off a nice little spiciness. Put the sausage in a pan with about 3/4 cup of taco sauce…and again, you can use mild, medium or spicy according to your taste. I use medium. (I’m a little bit of a wimp when it comes to spiciness. Not a mild wimp…a medium one. Just to be clear!) Now heat the mixture up for a couple of minutes, and while it is heating you can mix up your eggs…just beat them up until they are totally mixed and frothy. Now comes the fun part. Stir some crushed tortilla chips into the sausage mixture, and then divide the mixture among four individual serving dishes (you need nice oven-safe ramekins for this.) Spread it around until the bottoms of each dish are covered. Divide some grated jack cheese among the dishes. Now pour the egg mixture on top, making sure each dish gets an equal amount of egg. Next you are going to pop them into the oven and bake them until the eggs are set and the top is a nice bubbly brown. I like to put them all together on a baking sheet, which makes putting them in/taking them out of the oven a lot easier. Once they are done, you can either dig in just as they are, or you can add a little taco-style garnish. We liked sour cream and guacamole, but chopped tomatoes, salsa and/or chopped onion would all be scrumptious. Now, wasn’t that easier than doing battle with your omelet pan? I vote yes! Preheat oven to 400 and spray four individual oven-safe ramekins with cooking spray. Add sausage and taco sauce to medium skillet over medium heat for about 2-3 minutes until sauce is warmed. Whisk eggs in a medium bowl until thoroughly beaten and frothy. Stir chips into taco mixture. Divide taco sauce mixture among the four dishes, spreading until bottom of each dish is covered. Divide grated cheese among the four dishes, sprinkling to cover taco sauce. Pour egg mixture in even portions into each dish. Set ramekins on baking sheet and bake until golden and eggs are set, about 25 minutes. Test for doneness by inserting toothpick – it should come out clean. Cool for about 2-3 minutes, add garnishes as desired and serve. Updated from an earlier Framed Cooks post. Making this tomorrow night ! I just found taco sauce here ! now if there is such a thing as Jack Cheese, we are all set. My omelettes always turn into scrambled eggs also! I think they’re conspiring against us. Frittatas are totally my go-to because of that. Love the sound of this! Hurray, a fellow omelet non-maker! We can be co-presidents of the Frittata club. This is such a genius recipe!! It would make me enjoy my eggs more, that’s for sure! I love me a good fritatta recipe :) I just bought a whole bunch of eggs, so this would be perfect! It sounds like it was meant to be! Hope you love it. Individual frittatas are brilliant! And cute. I can’t resist an individual serving of anything. And my husband’s all about the Mexican flair, so I think our egg night tomorrow will switch from scrambled to this! I love that you have Egg Night – I might have to borrow that! I love omelettes too, but can ever make them look pretty! This frittata sounds delicious, Kate! I love the taco flavor! So creative! i love frittatas but i always seem to put the same old combination of onions, tomatoes, cheese, and herbs inside them. taco frittatas sound different and delicious! I love Mexican-style omelettes! My omelettes also turn into scrambled eggs :) Baked frittata is a great idea to make the eggs look pretty! I vote for frittatas over omelets every time – I am NOT a good omelet-flipper! Happy new year!!!!!!! !Brilliant recipe!! I think now i will enjoy my egg!! !Thanks for sharing this! This sounds amazing!!! I am a fan of anything that I can put avocado and sour cream on. Yum! Hi!!! !Happy New Year!Your recipe is simply amazing! Thanks for sharing this! Thanks Tally – hope you love it!